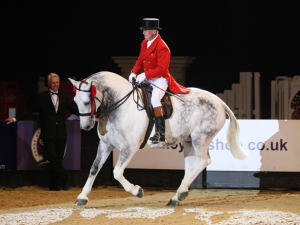 After another stellar performance in the Topham Barnes Riding Horse of the Year, reigning champion Diamonds are Forever III wasn’t ready to give up the Championship title at this year’s Horse of the Year Show (HOYS). The eight-year-old Warmblood owned by Annabel Jenks took the honours after securing the Large Riding Horse section earlier in the day with Norfolk’s Allister Hood. Small Riding Horse Casino III also successfully defended her title in the Small Riding Horse and went one better this year to stand Reserve Champion with Jayne Ross. The Warmblood mare is by Painted Black and owned by Diane Stennett. Second in the Large Riding Horse was Vanessa Ramm’s Irish Sports Horse Corbally Lucky Boy with Martin Skelton in the saddle. The 12-year-old qualified at Derbyshire Festival of Showing and was third in this class at HOYS last year. Patricia Duncan’s Kilnamona Glen stood second in the Small section ridden by Caroline Mackness. 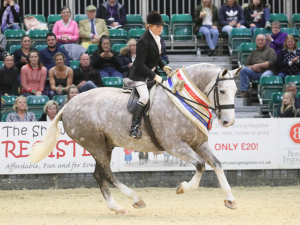 Baileys Horse Feeds’ Irish Draught, Jovian, looked every bit the Champion as he took his lap of honour in The Leeman Family Maxi Cob of the Year with producer and trainer Lynn Russell in the saddle. At just six years old, this was Jovian’s second appearance at Horse of the Year Show (HOYS), having qualified last year for the Ladies Side Saddle Horse of the Year Championship. He has now taken the ultimate accolade as a Maxi Cob. HOYS has been one of his first big shows this season and Lynn described the win as “fantastic” and “a big surprise”, having hoped he would be placed high up, but not expecting a win. The roan gelding is by Star Kingdom out of Lecarrow Gypse and was bought as an unbroken four-year-old from Ireland. Hayley Sankey rode her own four-year-old grey gelding The Ringmaster into Reserve position, while Xanthe Barker’s Kavanaghs Lord Winchester finished third. Sponsor Lisha Leeman from Essex presented beautiful sashes to both the winner and all of the runners up in the class, which has been running at HOYS now since 2011. Horse of the Year Show is a showcase for some of the country’s most prized and successful horses and ponies. 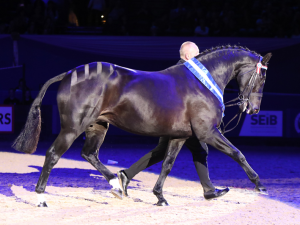 It should seem only fitting that HOYS hosts an evening to recognise the breeders and sires that provide showing with future champions. 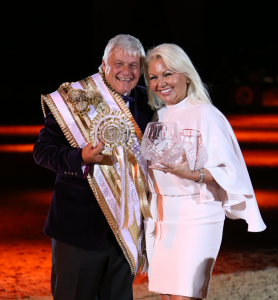 Introduced in 2012, the HOYS awards series have become an established part of the equestrian calendar and they are now much sought after accolades. The awards encompass the Kellythorpe Leading Breeder and Leading Sire awards as well as the LeMieux La Liga consistency awards. It is an opportunity to reward and recognise the fantastic success of breeders in this country, using a points system for all results in Horse of the Year Show qualifiers. The Kellythorpe Leading Breeder and Leading Sire awards celebrate the achievements of those who may perhaps not get time in the spotlight but absolutely must have the recognition that they deserve. The awards evening would not be possible without the generosity of the award’s sponsors, Richard and Lisha Leeman and their family. 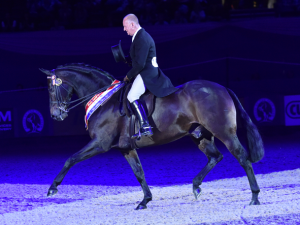 These awards are a privilege to present at HOYS, where people are able to see the final result. With each year the competition for these awards is stronger, which can only be a reflection of the importance and success of quality breeding programs. 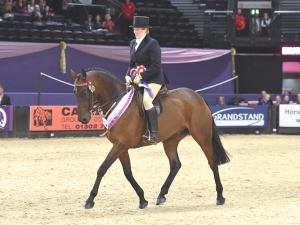 Broadstone Dolce Vita, William Moran and Pearl Underwood’s star mare, was crowned the new Cuddy Supreme In-Hand Champion at Horse of the Year Show (HOYS). The 17-year-old mare now has one of the most prestigious and sought-after titles in the showing world to her name, following a prolific winning ridden career with Suffolk’s Amy Underwood. She’s been with William for the last three years and together they have claimed numerous championship titles. The top two from the Horse and Pony sections at HOYS go through to contest the overall Championship, which is open to light horses and ponies of all breeds and type. Tinka’s Flash made a triumphant return to claim the National Pony Society/Snuggy Hoods Working Hunter Pony of the Year Championship. You could hear a pin drop as Friday afternoon’s audience in the Andrews Bowen International Arena waited to hear who would be crowned National Pony Society/Snuggy Hoods Working Hunter Pony of the Year Champion. In the end it was the Intermediate winner, Hannah’s Sloan’s 15-year-old Chestnut gelding, Tinka’s Flash who rose triumphant after a sterling performance throughout the day. Described as “quirky, but very gentle”, the Chestnut gelding has a very strong track record with numerous Intermediate titles including at the Royal International, in the Desert Orchid and at the Royal Highland Show. Reserve Champion went to the 133cm section winner, Camilla Lanni’s 12-year-old Welsh Section B Birkinbrook Arabella, by Millcroft Cruga out of Thistledown Miami. The crowds had been growing throughout the morning in the TopSpec Arena as the four class sections progressed. It was the ponies with the best rounds over the course of rustic fences that went forward to further judging for show and conformation. Essex-based Polly Eddis’ 14-year-old Connemara gelding Cashel Bay JJ took the 153cm section fresh from his second place in The British Show Pony Society Mountain & Moorland Exc. 143cm Working Hunter Pony of the Year yesterday, with Lucy Eddis in the saddle. The 143cm section went to Michelle Burnett’s 14-year-old Chestnut gelding Stambrook Maestro ridden by Ella Dalton. The Chinook is an able and versatile support helicopter that can be operated from land or ship in diverse environments. 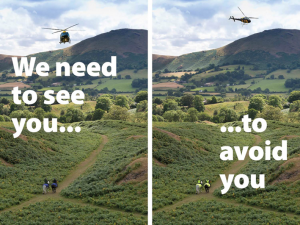 Pilots can spot horse riders at a greater distance and have more time to take avoiding action when they’re wearing high-visibility clothing. Royal Air Force Wittering has obtained a limited supply of day-glow tabards and quarter-sheets for nearby riders to wear so that they’re more visible to aeroplanes and helicopters alike. Unfortunately, the supply of high-vis gear isn’t endless, so priority will be given to registered riding schools and riding for the disabled establishments. Chloe Winchester described her opening day win at Horse of the Year Show as “what dreams are made of.” Chloe, from Suffolk, triumphed in the Talent Seekers, incorporating the seven-year-old, Championship, with Louise Saywell riding Mac Uwe finishing in second place on the leading seven-year-old. 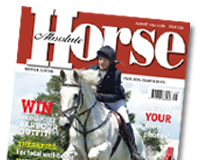 Chloe’s jump-off time of 37.11 seconds, on the 10-year-old bay mare Sportsfield Our Clare, proved more than a second quicker than Louise, while third place went to Bumble Thomas on Aramis. “I am absolutely over the moon,” Chloe said. “There was a bit of pressure in terms of going first, so I did as much as I could, and it worked out today. She has been very competitive throughout the summer, and I know if I push her, she will do whatever she can to jump clear. It is just amazing to win here – it’s what dreams are made of. It is such an amazing experience. 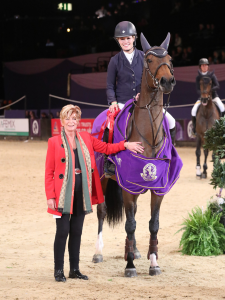 There were tears of joy as Ann Leftley’s 13-year-old ex racehorse Beware Chalk Pit took the honours in the SEIB Racehorse to Riding Horse of the Year Championship on day one of Horse of the Year Show (HOYS). ‘Pete’, as he is known at home, won more than £9,500 over his seven year racing career, trained by Jonathan Geake. He ran his last race just two years ago. The impressive 16.2hh bay gelding is produced by Justine Armstrong-Small and has been ridden by Rebecca Court for the last three seasons. 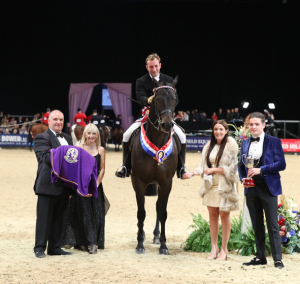 There will be plenty of time to celebrate before their second appearance at this year’s HOYS in the Topham Barnes Large Riding Horse of the Year on Sunday. After HOYS, Jonathan’s daughter will take on the ride and the pair are looking forward to a new life trying a bit of everything from show jumping to cross country. Helen Newbold rode her own Emperors Jade to second place while Grandeur, ridden by Jo Bates, took third.